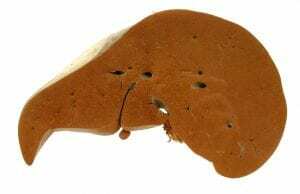 This extreme case of alcoholic fatty liver was taken from a 30-year-old patient who died from liver failure. According to the patient’s clinical history, he consumed on average 1 to 2 bottles of vodka each day for 15 years. Such an extremely high amount of alcohol consumed regularly from a very young age, ultimately caused fatal damage to the patient’s liver. At 3670g, this liver weighs more than twice that of an average healthy male which should be approximately 1500g. In the UK, alcohol misuse continues to the biggest cause of death, ill-health and disability in people aged between 15-49 – and although levels of consumption have dropped steadily alcohol abuse and addiction continue to be a problem. Whilst increasing the risk of liver disease and failure – alcohol’s indirect risks like increasing the likelihood of accidents and the perpetration of acts of violence are just as big a problem in the UK today. Exacerbating this issue, alcohol addiction often isn’t treated as seriously as addiction to illegal substances, so much so that only 1 in 5 people in the UK with an alcohol dependence are currently in treatment to help beat their addiction. Like all addictions, alcohol dependence is often the result of socio-economic circumstances and untreated underlying mental health problems, previous traumas or a combination of these factors. In the case of this specimen, there is not enough clinical documentation for us to fully gage why the patient began drinking such large amounts at such a young age, or the causes of the addiction that ultimately lead to his demise at just 30 years old.